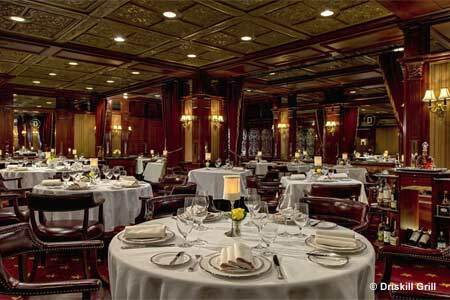 Elegant, historically grand aura with artful regional cuisine. : The combination of romantic lighting, formal table settings, fresh flowers and professional service makes us feel like we've stepped back in time at this elegant restaurant. À la carte selections are available (salmon charcuterie, prosciutto-wrapped pork tenderloin), but we recommend the five- or seven-course tasting menus. (Christian Apetz is the current executive chef.) Sommelier-guided wine pairings are an option with both, which is the best bet for navigating the extensive, globetrotting wine book. While the menu changes almost nightly, dishes have included a raspberry-kale salad with pomegranate vinaigrette, and filet mignon with roasted vegetables. And there's every reason to indulge in dessert, including the hazelnut crunch bar served with vanilla bean ice cream.